Based on the famous Battle City story arc from the classic Yu-Gi-Oh! 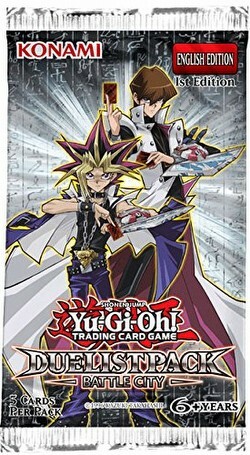 animated series, Duelist Pack: Battle City contains brand new cards plus classic favorites. This huge, 47-card Duelist Pack set includes cards used by Yugi, Joey, Kaiba, Bakura, and Marik, as well as brand new cards, making them instant must-haves. Also included are favorites like Red-Eyes B. Dragon, Blue-Eyes White Dragon, and more. The set includes 27 commons, 10 rare, 6 super rares, and 4 ultra rares.